for a ride to either Dresser or Marine on St. Croix. When you book your coach ticket, be prepared to step back in time and ride in style as coach travelers did nearly 100 years ago. Every Saturday and Sunday, enjoy riding the rails through the beautiful St. Croix River Valley in our historic passenger cars. 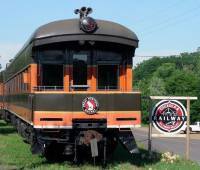 Tour through the cars and learn more about them and railroads from one of our car hosts. The train departs from Osceola Depot bound for Marine on St. Croix or to Dresser Depot. The trip to Marine on St. Croix is 90 minutes long. The trip to the Dresser Depot is a 50-minute ride. Tickets must be booked ahead of time as seats are limited. If you are looking to make a last minute booking, please call the Depot to see if we can accommodate your reservation. Dress for the weather. Questions? Please call (651) 228-0263 for assistance. All trains depart from 114 Depot Rd, Osceola, WI 54020. Excursions to Marine on St. Croix offer amazing scenic views, winding west through the bluffs of the St. Croix Valley. Round-trip is 90 minutes. Step back in time on this 50 minute round-trip ride traveling east to Dresser Depot on one of our vintage Empire Builder cars. The 50 minute route travels east to Dresser, Wisconsin and then back to Osceola. Celebrate Independence Day onboard MTM's Fireworks Express Train! Ride the rails with us from Osceola Depot to Marine on St. Croix and watch this town's amazing fireworks display. Enjoy the fall foliage on our Fall Colors excursion through the scenic St. Croix Valley. But if pumpkins are more your thing, book your ticket now for the Pumpkin Express Train & Bash!